Templatic WordPress Themes Review - Are They Good or Not? 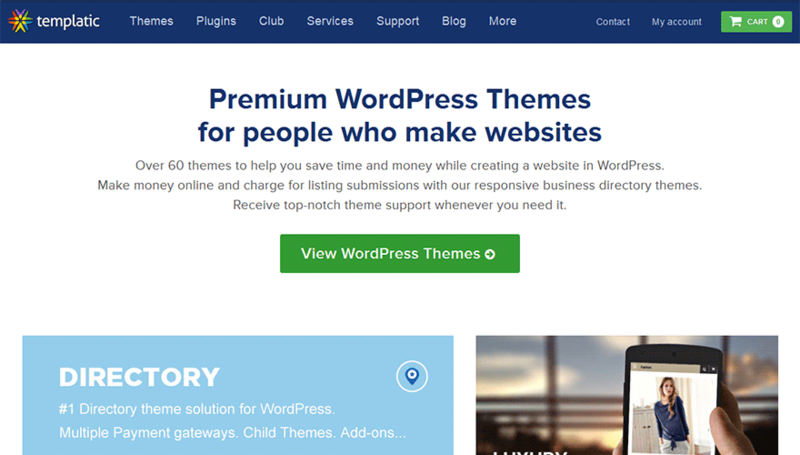 Templatic is a premium WordPress theme subscription service that provides high-quality themes for a monthly membership fee. The club provides regular updates on older themes, and definitely has a lot going for it. The costs are somewhat high, however, and customization is a little more difficult for Templatic themes than some other packages. Whether this theme club works for you or not will depend on your needs and budget. There is plenty to recommend them, and we’ll be sure to give you a thorough review of the positive features and the drawbacks. We’ve noticed a continued effort to upgrade their older existing themes to add features such as responsive design. Has some great themes for niche site concepts. Doesn’t offer a highly customizable framework. The backend system appears to lack functions other providers offer. Has a high cost-per-theme average. Templatic is based in India and has been operating since 2009. The company receives a significant amount of traffic and has a PR of 6. While there is no money-back guarantee on their services, Templatic does have excellent customer service and plenty of great documentation and tutorials for their themes. There is only one package available for Templatic-the developer’s package, titled Full Access. This package allows you to download all of the 50+ themes Templatic has available as well as access any new themes that are released during the time you’re a member. You also get access to the community support forum and the member only support forum. The first month is expensive-there’s a startup fee of $299.00. After that it’s only $15.00 a month, which is pretty low for a recurring payment. You’re given multiple use licenses for all of the themes so that you can use them on as many websites as you like, commercial or personal. You may re-subscribe at any time after cancelling but only by paying the startup fee again. You get access to design PSD files as well for easy updating of background images. The theme quality is decent but not the best we’ve seen, mostly in the sense that the themes are difficult to customize (more about that in the section below). Themes are easy to search through using categories like portfolio themes, multimedia themes, magazine themes, eCommerce themes, and others. You’ll find themes for specific niches as well such as real estate, price comparison shopping, hotel bookings, deal sites, travel sites, and more. The specificity is great, and one of the best features of the service overall. If you have a very specific niche, you may not need to do as much customization as you normally would, which perhaps makes up a bit for the lack of theme options. There are various theme options available including responsive design (themes which will display properly on any device), field customization, different types of buttons, custom widgets, multiple posts types, and blogging features. Nonetheless, this is actually a fairly exhaustive list, which isn’t that great. The backend system appears to lack functions that other providers offer. The framework is not highly customizable. Since there are so few options compared to other services, this is quite a detractor in general. We definitely would have preferred to have a greater level of control over the details, especially at the price per theme. Customer service for Templatic is top notch with extensive documentation and video tutorials to help you learn how to use the platform. There is a support forum and an email/ticketing system you can use to get answers to your questions, as well as a blog and social networking features to provide you with updates.